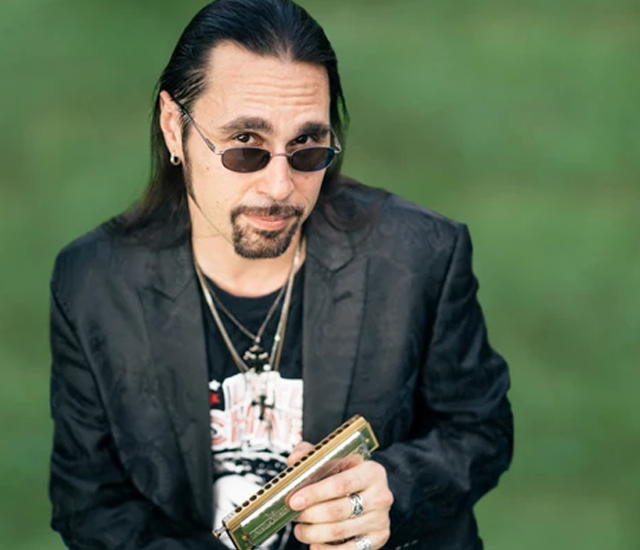 I am a self-taught harmonica player, and have been teaching blues harmonica to others almost as long as I have been performing professionally (which is about 25 years). Primarily a tongue-blocker, I did most of my learning in front of my stereo with thousands of records, and in front of the bandstand watching and listening to some of the best touring blues players of the day. I love to learn and to break things down to see how they are pieced together. This is how I taught myself, and how I teach all of my students. To me, the “big picture” is very important as a musician, not just the notes. The Big Picture includes the groove, timing, phrasing, tone, and correct technique…but also what and when NOT to play. These are all important parts of making music and expressing yourself effectively, which in my opinion is really the biggest part of this music. I believe music should be expressive and fun, and I also believe that with focused practice and feedback, it is possible for anyone to enjoy it even more, both as a listener and as a player. 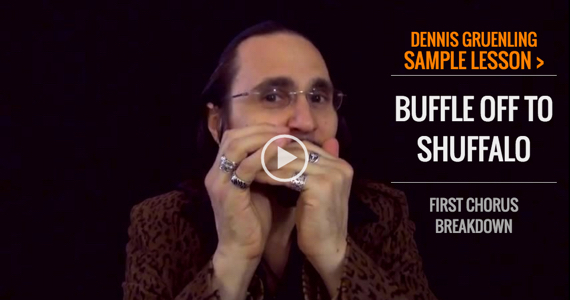 To get you started, please check out my free sample lesson: Buffle Off To Shuffalo - First Chorus Breakdown. Hi Everyone - in this lesson we start taking apart my new study song "Buffle Off To Shuffalo". The overall idea behind this piece was to work in as much rhythm (in particular, shuffle rhythm) chops as possible in many ways. It won't be a bad idea if you want to work on your timing and rhythm in general as a separate skill, apart from just doing it for this song. Real good timing and rhythm chops come from years of working at it, so get cracking with that metronome in your practice time to get in the groove so you can become a rhythm machine! Of course, there will be some other techniques at work here such as split intervals, but the focus is really heavy on the timing and rhythm, which when mastered, will make you that much better of a musician! Grab your C harps and give it a go!